Touch base with our industrious team's literary achievements as we approach the halfway mark of 2018! 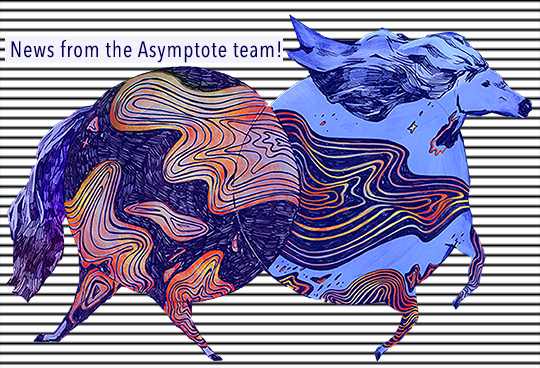 We have such an amazing group of creative people over here at Asymptote. Check out some of our recent news and stay tuned for more of the international literature you love! Poetry Editor Aditi Machado’s book of poetry, Some Beheadings, has been awarded The Believer Poetry Award. Communications Manager Alexander Dickow has published an article in French on the creative imagination in Apollinaire’s Méditations esthétiques in Littérature’s 190th edition. Editor-at-Large for Romania & Moldova Chris Tanasescu aka MARGENTO delivered a computational poetry paper at a major Artificial Intelligence conference, presented a Digital Humanities paper at Congress2018, and has flown to Europe to launch a computationally assembled poetry anthology.